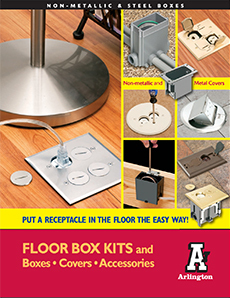 With a variety of floor box kits and individual metal covers and accessories, Arlington offers just about any option you could possibly need. Our new line of kits delivers convenience and interchangeability with many other manufacturers’ floor boxes as well as our own. Models are available for existing or new floors, boxes that adjust up to 2 inches to finished floor height, and for new concrete pours. Choose from single or two-gang floor box kits with steel boxes or combination box kits with an installed divider for power and low voltage in the same box. Kits come complete with all parts needed for quick installation. Gasketed brass or nickel-plated brass covers are available to prevent water intrusion. 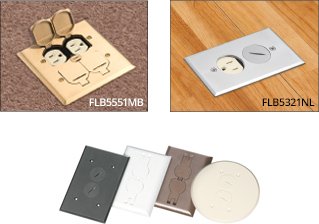 Covers comes with threaded plugs or flips lids to protect the receptacle when not in use. Non-metallic gasketed covers are UL Listed and come in four decorative colors including white, light almond, brown, and black. Covers are oversized to hide miscut flooring and are available with threaded plugs or flips lids to protect the receptacle when not in use.